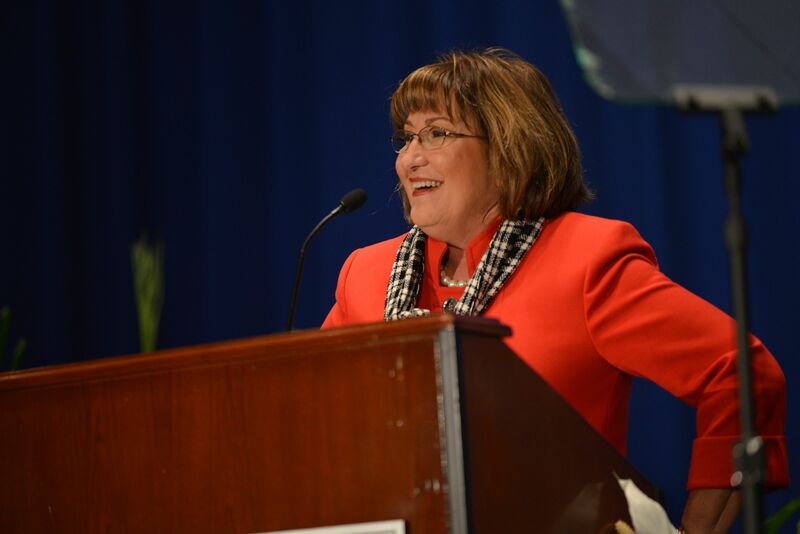 Mayor Teresa Jacobs hosted the 2014 Orange County Economic Summit on January 21 to discuss the expanding economy, business related programs and the region’s new branding initiative. More than 500 people attended the free event, which was held at the Orange County Convention Center. Citizen engagement is critically important to Orange County and Mayor Teresa Jacobs. “From CEOs to start-up collaborators, this year’s Summit provides an opportunity to hear from experts about the potential impact of factors ranging from demographics to industry trends, as well as information about resources available within Orange County,” Mayor Jacobs told the capacity crowd. Mayor Jacobs was joined by elected officials, local experts and distinguished panelists. A highlight of the event was an annual economic update by Sean Snaith, Ph.D., director of the University of Central Florida’s Institute for Economic Competitiveness. Snaith is a nationally recognized economist in the field of business and economic forecasting. Rick Weddle, president and CEO of the Metro Orlando Economic Development Commission (EDC), Ken Potrock from Walt Disney World and Tom Macaluso from Anson Stoner unveiled a new branding initiative. The initiative is the culmination of a branding summit held by Mayor Jacobs in 2012 and subsequent efforts of the Regional Branding committee. The branding theme —“Orlando. You don’t know the half of it.” — is designed to highlight the many corporate assets Central Florida has to offer. To complete the event, a panel of experts and leaders, including Jerry Ross from the National Entrepreneur Center, Tom O’Neal from the UCF Business Incubation Program, Rosalind Stober from the Hispanic Business Initiative Fund, and Inez Long from the Black Business Initiative Fund shared their insights and information about resources available in Orange County. “From small business initiatives to catalyst projects that will revolutionize entire industries, Orange County Government is committed to creating a community with a superb quality of life, in which our children and families – as well as our economy – will flourish,” said Mayor Jacobs. A variety of photos from the Economic Summit are available for use by the media and are located on Flickr, http://www.flickr.com/photos/mayorteresajacobs/sets/72157640077618716/.